The Russian space agency's first Angara-A5 heavy-lift rocket launches on its maiden test flight from the Plesetsk Cosmdrome in northern Russia on Dec. 23, 2014. WASHINGTON — The Russian space agency, Roscosmos, successfully demonstrated the heavy-lift version of its long-awaited Angara series of rockets Dec. 23 from the Plesetsk Cosmosrome in northern Russia, the agency said. 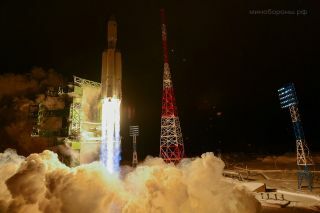 The Angara-A5 successfully placed a 2-ton dummy payload into geosynchronous orbit some nine hours after lifting off at 8:57 a.m. local time, according to the Moscow-based Khrunichev State Research and Space Production Center, the vehicle's prime contractor. After separating from the third stage, the Breeze-M delivered the dummy payload to the desired orbit. As planned, the upper stage remained attached to the dummy payload, and subsequently performed two additional maneuvers to reach a graveyard orbit, Khrunichev said. Angara is a modular series of rockets designed to launch different classes of payloads to various orbits. The heavy-lift version will enable Russia to launch geostationary-orbiting satellites from its own territory. Currently such satellites are launched from the Baikonur Cosmodrome in Kazakhstan aboard the Proton rocket, which uses a highly toxic hydrazine fuel. The Angara-A5 flight follows the successful launch in July of a smaller version of the family, Angara 1.2, on a suborbital mission.